Stampin’ Creative – Alternative Christmas Colours! Blog Stampin' Creative Sept 16 - Trick or Treat? Welcome to this months Stampin’ Creative Hop & this months theme is Trick or Treat? for today I am bringing you a treat…. or should I say a treat box! Have you spotted these in the new Autumn/Winter Catalogue? These are the perfect size for a little treat and really easy for decorating. 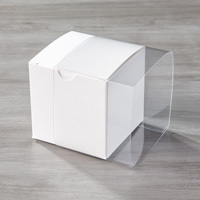 This box has been decorated with the fabulous Cookie Cutter suite of products. To coordinate with the box I also make some matching cards – these were a set of cards from my early Sept class. The little house and the card to the far right have been made by cutting out the designer paper for the embellishments. Do you live in the Littlehampton/Worthing area? Would you like to come along and make some of your own Christmas cards this year? Why not contact me to find out more – See my Classes page for more details. Be sure to hop all the way around as I know everyone will have a fabulous Trick or Treat for you. I am now sending you over to the lovely Louise who I know will have a treat in store for you……. or maybe a trick? Either way – enjoy! And your little box is just adorable. Thanks for sharing these Emma, they are a hidden gem in the catalogue! And great to see the size with the cards next to them as I imagined they were smaller but they actually look a really good size! Hi Emma, great ‘little’ boxes, you can get a nice amount of chocolate in these can’t you. What a lovely project. I also love the cards you made for your class, Emma. Such cute cards & box – love them all!